A very unusual radio epitomizing the radio deco era. 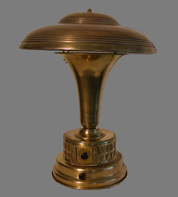 Little is know about the manufacturer, Radio Lamp of America. They made several sets pre-WWII, but I have not seen any after. The tubes and chassis components are crammed into the lower base section with a small line running to the very top which houses a small speaker. This radio, a breadboard type, is in excellent original condition with both labels on it's bottom. It's accompanying speaker, the model M is shown below. This set and a few other AK breadboards are among the most sought after of the early radio genre commanding prices well in excess of $1000. The metal cabinet for this radio is in great condition. This is the second of the two horns that I own. It is impressively large with a height of 25 1/2 inches. Maybe the most popular of this type speaker from Atwater Kent. I say this because of the number I encounter at radio swap meets. 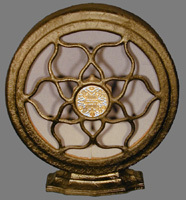 This is a smallish speaker only 11" in diameter. I like it because of its wrinkled black paint and it's simple yet effective design. I am also compelled to mention that it is a favorite of my wife's. 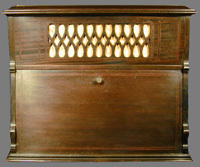 This beautiful radio is in fine original condition with only the grill cloth replaced. It has an internal horn speaker as well as posts for an external one. I don't know much about the Operadio Corporation or this speaker. I did find out though, that there is a smaller version called the "Junior". This is an exceptionally heavy speaker, partly because the horn was made of plaster. My wife says that this speaker reminds her of the Japanese flag. This set is in perfect condition and perfect working order. This was the first horn speaker I added to my collection. 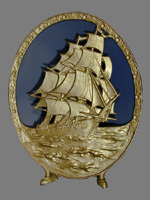 I like it because the top half is made of bakelite and I have it polished to a nice luster. This happens to be my wife's favorite speaker. 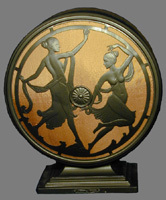 It is unusual for its almost risqué but typical 20's dancing ladies design. 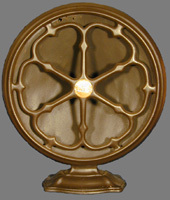 This speaker is the same size as the castle speaker shown below but is painted cast aluminum. This is my personal favorite of my speaker collection. 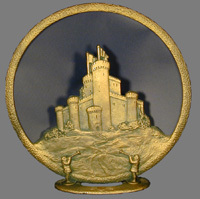 It's a cone speaker with the rim and castle made of brass. This large speaker was probably made by the Tower Corporation but I'm not sure. 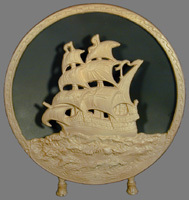 It is a quite large cast aluminum design measuring 15" by 23". Another interesting aspect of this speaker is the two red and blue painted bulbs which back light the ship.